Winter is a great time for knitting since there are less daylight hours and it is so cozy to curl up on the sofa and knit up some garment or other. Even though I knit throughout the entire year, it is something special and very comforting during the darker season. At the end of January a very special little girl turned three. I have been knitting for all of her birthdays so far - I showed you the projects here and here - and this year didn't make an exception. I find a lot of knitting projects on Pinterest where I have several knitting boards and when I saw this pattern I knew this was the one for the Kiddo. It has a beautiful leave pattern down the front of the cardigan - unfortunately you can't really see it that well in my photos. In the back it has a super cute ruffle row - easy to make and such a nice touch! I am currently knitting this cardigan in a bigger size for another little girl, and this time I used a worsted yarn. I will show you how it looks when it will be done. I still need to do the neckband and sew on the buttons. My friend Lyz celebrated her birthday in February, and since she had lost her home and everything that was in it in last October's firestorm I made a sweater for her. My yarn store had my favorite worsted yarn - Malabrigo Rios pure merino - in a truly scrumptious color, called "Reflecting Pool". Lyz's name was written on it! The sweater is called "In Stillness" and is a very simple, but beautiful pattern. Now, knitting a sweater is always a bit tricky. I had Lyz's measurements, but I couldn't try halfway through whether it would fit her since it was supposed to be a surprise. Sometimes I had doubts that it would be too small, then I thought she might not like the color... anyway, a couple weeks ago we met and I gave her the sweater. She tried it on and - what can I say? It actually took my breath away, she looked so beautiful. The sweater fits perfectly, and only I know where the mistakes in the pattern are. The pattern description was sometimes a bit unclear and the stitch count was downright wrong, but somehow I managed to follow it and even learned a new cast-off technique. In between I knitted a Baa-ble hat because I needed a quick project before starting another sweater, and this hat knits up so fast and is fun to make. 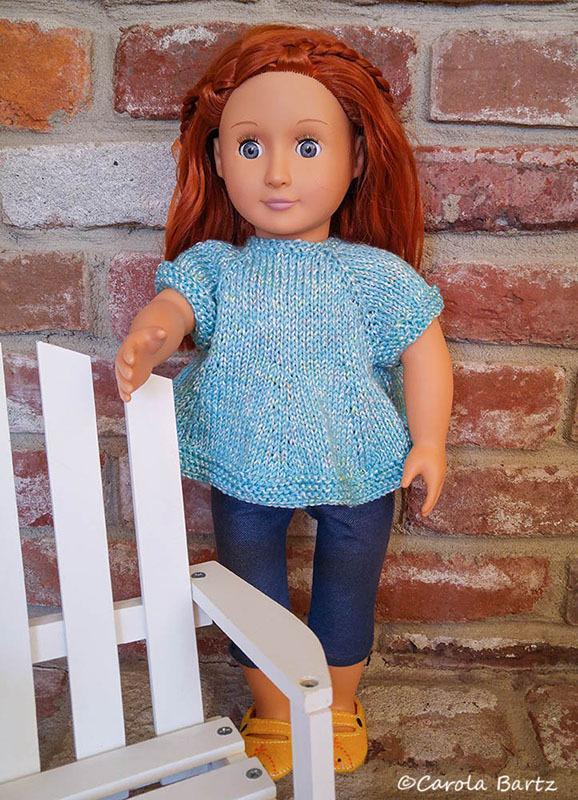 As you know I love to knit clothes for dolls, especially 18-inch dolls like American Girl dolls or the My Generation dolls you can get at Target. This blue swing top is really cute and not very difficult. The trick is to pay attention and make the increase stitches in the right places which I sometimes forgot even though I had stitch markers everywhere. There are times when I just get carried away and knit and knit - and forget to do the important increases (or decreases for that matter). I'm not quite sure about the yarn. It is an acrylic yarn, but I don't know by which company. A friend of mine who passed away last summer once gave it to me from her own stash and it didn't have a label. I do like the light blue and the tiny specks of white, pink and yellow in it. It also has a subdued glimmer. 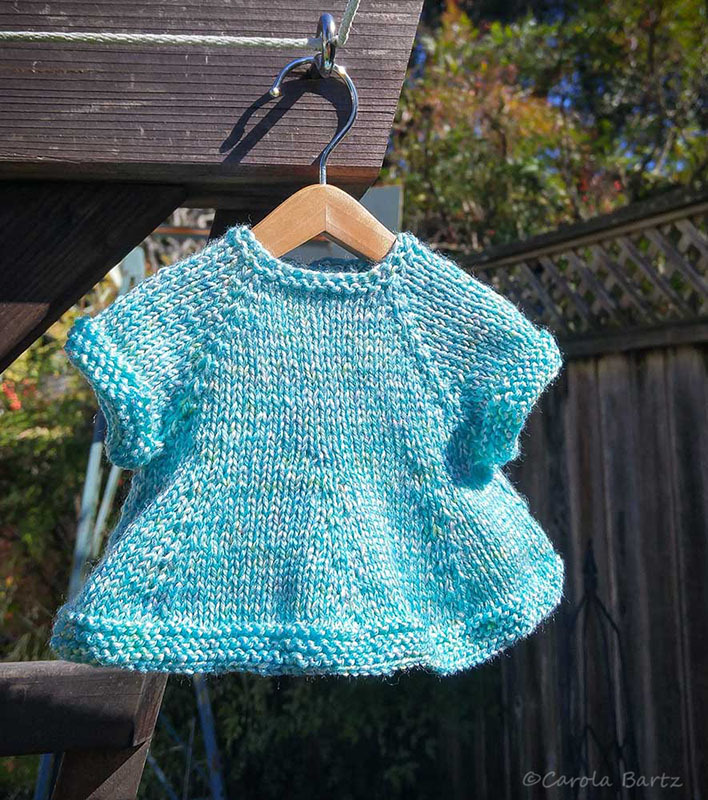 This swing top is knitted from the top down, no seaming needs to be done. Three buttons are in the back so that even small hands can put it on and off easily. I'm making a pair in the purple color right now. When you see the yarn as a hank you can't really see how beautiful it will turn out when it is knitted. Remember the socks I made for myself last year? That is the orange-red yarn from this very same series! Awe and wonder. My fingers are all thumbs and I look at your work with oodles of awe and wonder. And the birthday girl looks brilliant in your gift and I have no doubt that Lyz does too. Gifts to treasure. A beautiful sweater for a beautiful special girl! Your knitting is wonderful. On and off through the years, I've enjoyed knitting - but find I don't really have the patience needed to keep at it. I always love seeing beautiful hand knitted items, and think - maybe I'll do this again, someday. Oh my -- that sweater was pretty just in display but on her it is exquisite! What a gorgeous child and she wears it well! Loving your socks! Thank you for stopping by my blog today. It is so nice to “meet” you. 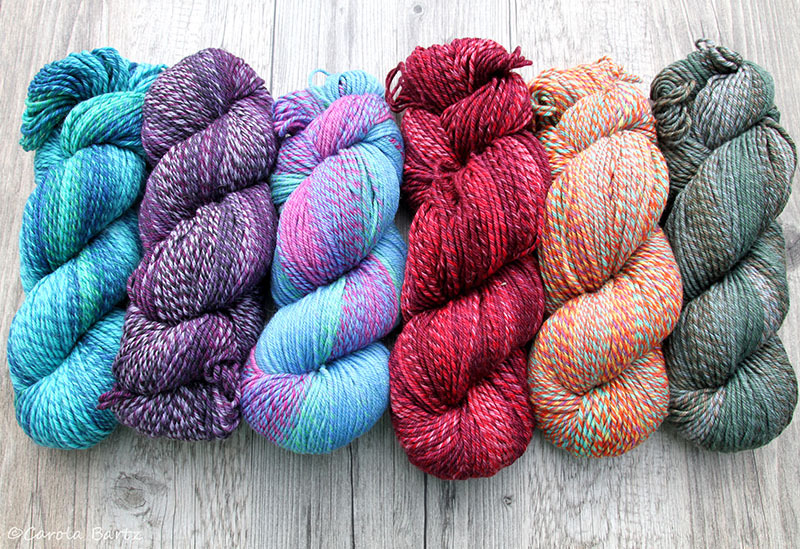 I loved this post about knitting. I so envy you ladies that have this skill! I keep thinking I will learn how to knit, but the few times I’ve tried to learn, I’ve not stuck with it. It must be so relaxing to knit, and you have wonderful projects, gifts, and useful items to show for your time. I admire people who can make amazing knitted creations. I don't think I have the patience to sit that long. When can I put my order in? LOL! Wow girl, you are talented! I love them all! That first cardigan is so precious and I love the picture! So adorable! That little girl is priceless! Big Hugs! Hi Carola, long time no see. Love those sweaters and socks. Hope the world has been treating you good. I'm mostly on Instagram now. Have a wonderful life. Your knitting projects amaze me, Carola. How special that you knitted a sweater for the little one. And I love that little blue doll sweater and the pretty color. Your cozy socks looks so warm. Keep knitting, my friend. What a wonderful hobby this is. I believe this little cardigan is the sweetest thing I've ever seen until I saw it on that precious girl, so perfect and so is that gorgeous blue sweater. You really do beautiful work, my friend. all your knitting is lovely. the first piece for kiddo, well she and the sweater are beautiful together. So special. You've been very busy, Carola, your knitting is so lovely ! That sweet little girl looks so pretty in her new cardigan ! 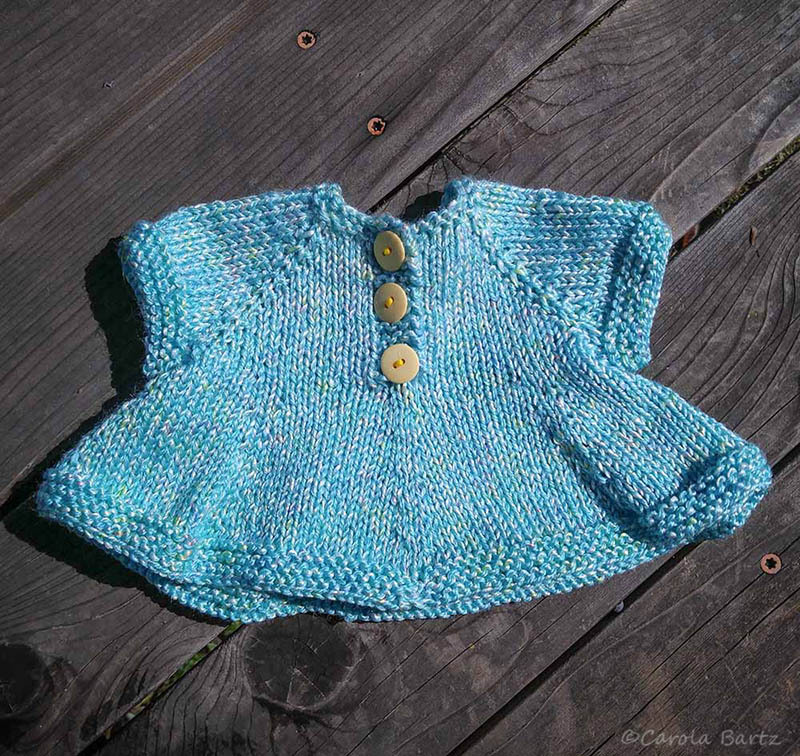 Carola, all of your knitting projects are so beautiful! And those orange/gold socks are like a warm hearth for the feet. They don't pale in comparison to ANYTHING!